As the first and longest-running public charter school in Queens, New York, Merrick Academy has to keep up with changing trends so it can continue serving its students and their families effectively. When Merrick Academy noticed that its reception area was getting crowded and cluttered, they looked for a solution. “We were having so many people at the front desk with so many different issues, whether they were picking up a child early, or a delivery person came, or they needed to see a teacher,” says Chris Levy, staff developer at Merrick Academy. “We also had a lot of paperwork, so the front desk area was filled with a bunch of sign-in and sign-out sheets.” Levy says they wanted to streamline front desk operations and condense the associated paperwork. That’s when they found The Receptionist for iPad. Now Merrick Academy uses the visitor management system for visitor check-in, badge printing, delivery notifications, and events. “It keeps a running log so we don’t need a physical sign-in sheet anymore,” Levy notes. “Also, for events we have a one-touch sign-in that makes things quicker” when many visitors arrive at once. According to Levy, with The Receptionist for iPad, “the front desk is a lot calmer now than it was last year. Instead of having to tell people ‘sign here, sign there,’ we just direct them to an iPad. It’s self-explanatory. We point them in the right direction, and The Receptionist for iPad does everything else.” Levy adds that The Receptionist for iPad reinforces the school’s brand and projects a tech-forward image. “We look a lot more professional, and the front desk looks more tech savvy. Having our brand logo right on the iPad—the first thing you see when you walk in—is excellent for our brand image.” Levy also appreciates the support from The Receptionist staff, particularly through the online help desk. “They’re easy to talk to—somebody is always available,” he says. “The customer service aspect has been the best part because I’m able to get answers so quickly.” In sum, Levy says, “The Receptionist for iPad meets all of our needs. The communication between the front desk and the teachers has improved. 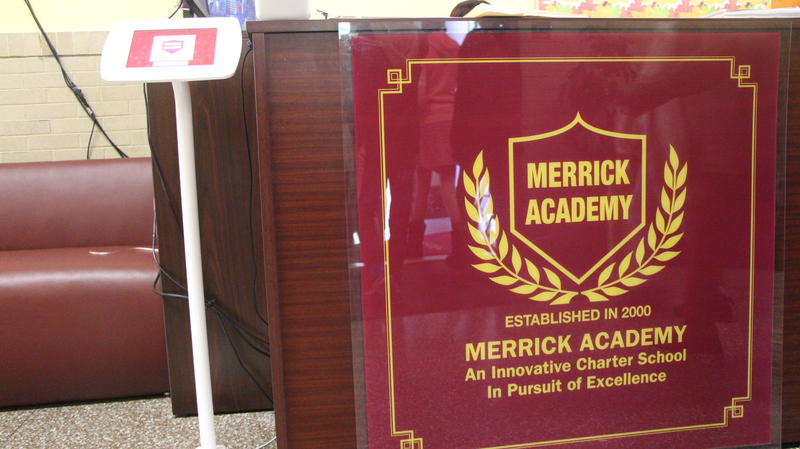 It’s been very effective.” Thank you, Merrick Academy, for choosing The Receptionist for iPad! We’re elated to hear how it’s helping your reception area run more smoothly for the parents and students you serve. Founded in 2000, Merrick Academy is one of the first charter schools to open in New York City and the very first to open in Queens. Merrick Academy is located in Springfield Gardens and serves nearly 500 students in kindergarten through 5th grade. The Academy is built on the philosophy that all children can learn, and the focus of the Academy is based on the core skills of reading, language, and mathematics. Merrick Academy is organized to provide an extended day, a high degree of individualized instruction, and an innovative, research-based academic curriculum. For more about Merrick Academy, visit their website.